No I am not a sailor although I did once have a very fun weekend on a sailboat in the Chesapeake as a hapless, but supportive, passenger. I am afraid this metaphor of a keel that allows steering regardless of the direction of the wind has been invoked as the official analogy of those who wish to use education in the 21st century globally to change human behavior and ” design a new, organic, socio-cybernetic system for the management of society.” Please do take a deep breath before we continue. At least now we know why the virtual reality science simulations planned under Common Core Next Generation Standards have been focusing on illustrating force and motion in addition to all the ‘supposed’ threats to the environment. These days any content allowed through virtually always has a purpose in creating a transformational mindset. Today’s discussion is largely from a 2011 paper by Scotland’s John Raven called “Competence, Education, Professional Development, Psychology, and Socio-Cybernetics.” It has global aspirations and fits perfectly with UNESCO’s use of the term “Cybernetics of Global Change” as part of its MOST-Management of Social Transformations-official program. Apparently, we, the hoped-for victims and funders of these transformation plans, are the only ones NOT familiar with just how often the planners have begun to think in terms of how to invisibly gain control of human behavior to manage society. That control lever can occur, according to Raven, through a socio-cybernetic, competence, focus in education plus new political rules. Since stating this out loud would create a popular outcry that might interfere with plans for subjugation, the same developmental push gets sold globally now under the blissful, but misleading, term–focus on Excellence. The other necessary component involves changing the political governance arrangements, which is of course exactly what the UN’s Agenda 21 seeks to do. Majority rule, judicial overreach or neglect, regulations, and power to appointed boards instead of elected ones all work quite nicely too. And the programmers, such as ISTE keynoter Jane McGonnigal, have been quite graphic that these games are being designed to create a mindset that believes in the need for social transformation. Sim City creator, Will Wright, was quoted as saying his games are adapted from Jay Forester’s World Dynamics work, which once again takes us back to the Club of Rome, the 1970s, and the desire to push systems thinking in education, economic planning, and the now-proverbial means of managing society. Cybersociety recognized that “representing flux and change is exactly what a simulation can do”, making it a far more effective tool for altering the nature of human experience and illustrating the possible causes of social change. A very powerful, highly visual, weapon we are mandating for classrooms and ‘assessments’ without giving a second thought to its use as a driver of how the student’s mind will perceive the need for social change. Computer games have become so ubiquitous that remembering that they were once recognized as “where we go to play with the future” gets overlooked. So does the fact that the future is not the least bit bound to follow the variables set up in a software virtual simulation. Just ask Putin. Fostering a belief in things that are not true, and collectivist values that leave you unprotected against either foreign invaders or domestic predator politicians, is no way to become an adult. Making computer gaming the focus of the classroom because it is engaging and increases graduation rates still omits a crucial fact all the programming world still remembers. The gamer unconsciously and intuitively “internalizes the logic of the program.” Just the thing in other words for those who want social transformation and people who can be steered like the keel of a boat. Precisely the metaphor Raven chose to both use and illustrate with drawings of a boat. Marry those manipulative visuals to an express declaration for a “dramatic reorganisation of most peoples’ thoughtways” via schools and universities and we indeed have a problem. All being implemented into a classroom near you without a By Your Leave under banners like the Common Core or Positive School Climate or a 1:1 Laptop Initiative. The attempts to manage society and achieve new forms of governance will not be successful. Only the extent of wealth lost and prosperity trashed is in dispute. The intended damage to be delivered via education to the psyche, false beliefs, and pernicious or naive values is unstoppable unless enough people realize there is no dispute at what is being sought or why. Intentionally created financial conflicts of interest seem to be the norm to coerce adults into either complying with, or actively advocating for, this vision of education. In the US I see it being pushed under federal civil rights laws as necessary to have Equity and Excellence. The very title of the global ed summit that commenced today in New Zealand-“Excellence, Equity, and Inclusiveness: High Quality Teaching For All” tells me this developmental, obuchenie, new view of ‘intelligence’ grounded in group interactions is a deliberate global phenomena. If only someone could create a computer simulation for politicians and school administrators showing the true social effects of such widespread mind arson. 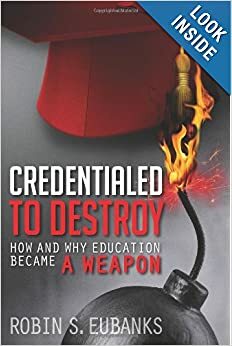 Does that title give more clarity to why those Essential Learning Outcomes from the last post must now be what the student becomes and believes as a result of school and college? How about the official Democracy push via education for a new cooperative commonwealth in the future? Or using contemplative practices in the classroom to bypass the rational mind and make the Heart the driver of what will become reflexive Habits of the Mind? We in the US especially, but also as the dominant vision all over the West, simply have always seen ourselves as individuals first. A vision of the Governors and the Governed is alien to our psyche. But unfortunately it is not alien to the druthers of an awful lot of influential people who would like more power please. Or who get together with each other–politicians, foundation heads, Big Business titans, and bemoan their decaying power To Get Things Done. The Loss of Their Grip on Society. So one way to look at all these education reforms whose true target seems unfathomable to us since it shuts down useful knowledge is as an Oligarch Protection Scheme. Now I have generally known that but in March 2013 the book The End of Power: From Boardrooms to Battlefields and Churches to States, Why Being in Charge Isn’t What It Used to Be was published. Yes, I am considering nominating this book for whiniest title of the year but that is not why it caught my attention. You see, its author, Moises Naim, is a scholar at the Carnegie Endowment for International Peace and the former Editor-in-Chief of Foreign Policy magazine. Now maybe you are unaware of just how many of the controversial ideas in education have been funded by the Carnegie Corporation of New York but I am not. So I ordered the book hoping for insights into what Carnegie’s plans were now for all of us. What it is really pushing under the cover of Common Core or EdLeader 21 or High Tech High replicas or Early College High Schools or those Next Generation Science Standards. Can you say Bingo? Or Touchdown with a conversion for a total of 8 points from the play? Now how’s this for the back cover endorsements of the book–former President Bill Clinton, George Soros, Arianna Huffington, the President of Brazil, and Francis Fukuyama. The last one makes me wonder whether the End of History ended where we thought. The first one is a reminder that all these ed reforms were hoping to be fully implemented in the 90s. If you check the Acknowledgments page, Naim thanks the President of the Carnegie Endowment by name for all her help with the manuscript that became the book. He also thanks the President of the Brookings Institution, Strobe Talbott, by name and former Treasury Secretary, Larry Summers. So this is the official What the Oligarchs would like to See Going Forward Vision. What drives grantmaking and the research that is pushed in education or other related areas like Metropolitanism or Immigration or Regional Equity generally. I have gradually put together that all these changes are part of a common, governments at all levels, led vision for the future. But the Oligarchs just talk about it over dinner or while jetting to conferences like Davos. They Know because it is part of their ongoing conversations. Positive for whom? For the family paying real estate taxes that put a strain on the family budget while Supers and their staffs deliberately push Mind Arson in the schools? When you deal with a Principal who refuses to listen to valid concerns or a PTA President who does not care that teacher professional development is being led by someone who has openly held up Mao Tse-Tung as an example of leadership, just remember what is really going on is a struggle for the soul of people and nations. A desire that schools now foster Mindsets of dependence and a belief in the need for collective action to address supposedly insuperable global problems and challenges like Climate Change and Overpopulation and Nuclear Proliferation. Well, indispensable to Oligarchs who want to transform the way “humanity organizes itself” for their own benefit. So they use education for Mind Arson and new beliefs and values. All trackable now via personal data. In the name of economic growth, the urban areas are quietly seeking a shift to a planned Cronyistic regional economy and calling it the Metropolitan Revolution. Have you read it yet? All supposedly necessary again so “we will be able to tackle the most pressing global challenges.” Who are they kidding? These global problems are just the excuse for a feast at our expense and a future of invisible chains and continuous taxes as the Oligarchs enjoy themselves. And take care of each other. We are truly to be just passengers that exist for the sake of the ship. So when you read a presentation like this recent one http://www.p21.org/storage/documents/Presentations/Education_for_Life_and_Work_Feb_2013.pdf that you and I were not invited to attend since we might have wondered why the Common Core assessments were to actually focus on intrapersonal and interpersonal competencies, remember now it is assessing Mindsets Suitable to be Governed. Don’t forget to notice the slide thanking all the sponsoring foundations including Carnegie. You may never have heard of the Committee on Defining Deeper Learning and 21st Century Skills of the Division of Behavioral and Social Sciences of the National Research Council. But the NRC also tracks back to Carnegie funding. 1919. But with governmental sponsorship now. Cool, huh? Binding and mostly out of sight. Carnegie also funded this report “The Heart of the Matter” issued in June to change the direction of humanities and social sciences instruction to “address major global challenges.” Of course and all we need are basic competencies now from K-12. http://www.humanitiescommission.org/_pdf/hss_report.pdf . Don’t forget to notice that the head of that NRC Behavioral Division is a member of that Humanities Commission. And when you read that very troubling report, don’t forget that Paul Ehrlich said the humanities are to be the focus now on how to change human behavior. That his MAHB is now doing for UN entities. Which are also tied to Carnegie funding. Not having to pay taxes just leaves so much more money to use to mess with the psyche of those of us who do. And to plan and scheme and coordinate. Especially with those other foundations. Who all have such transformative plans for us. Let us be forever grateful that the Oligarchs put so much in writing upfront. And that we can still read and think and act.